Novelist, essayist, editor and NPR mainstay Cheuse (To Catch the Lightning, Listening to the Page) compiles a highly literate travelogue from material previously published in Gourmet, the Antioch Review and elsewhere. In ""Reading the Archipelago,"" Cheuse&apos;s survey of Indonesia-centric literature is so compelling it will make readers want to pick up some Conrad and Melville. The clever ""Thirty-five Passages Over Water"" covers notable journeys, the parts that come before or after the destination, moving backward in time. ""CODA: Two Oceans"" evokes the Jersey native&apos;s Atlantic/Pacific memories. 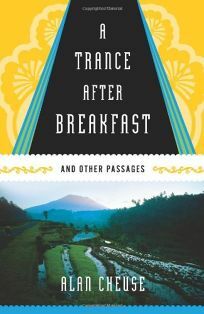 The title piece recounts Bali&apos;s atmosphere of spirituality, but isn&apos;t as strong as his reporting from the U.S.-Mexico border at San Ysidro: ""the great crossing point, nexus of cultures, nexus of countries, nexus of vision, nexus of borderlands between first world and third""; he&apos;s just as piercing regarding the psychology of those who make the trip across. Though it starts slow, three Mexico narratives prove splendid enough to forgive; Cheuse&apos;s eclectic journeys shine a spotlight on one of the greatest rewards of travel, ""to know... something quite valuable that had never occurred to us before.""